On this date in 1721 Johann Sebastian Bach dedicated the Brandenburg Concertos (BWV 1046–1051, original title: Six Concerts à plusieurs instruments) to Christian Ludwig, Margrave of Brandenburg-Schwedt. They are widely regarded as some of the best orchestral compositions of the Baroque era. Bach wrote out the music himself for presentation to the Margrave rather than leaving it to a copyist. While he took the opportunity to revise the music, most likely, it was not freshly composed. He appears to have selected the six pieces from concertos he had composed over a number of years while Kapellmeister at Köthen, and possibly extending back to his employment at Weimar (1708–17). As I had the good fortune a few years ago to be heard by Your Royal Highness, at Your Highness’s commands, and as I noticed then that Your Highness took some pleasure in the little talents which Heaven has given me for Music, and as in taking Leave of Your Royal Highness, Your Highness deigned to honor me with the command to send Your Highness some pieces of my Composition: I have in accordance with Your Highness’s most gracious orders taken the liberty of rendering my most humble duty to Your Royal Highness with the present Concertos, which I have adapted to several instruments; begging Your Highness most humbly not to judge their imperfection with the rigor of that discriminating and sensitive taste, which everyone knows Him to have for musical works, but rather to take into benign Consideration the profound respect and the most humble obedience which I thus attempt to show Him. Because King Frederick William I of Prussia was not a significant patron of the arts, Christian Ludwig seems to have lacked the musicians in his Berlin ensemble to perform the concertos. 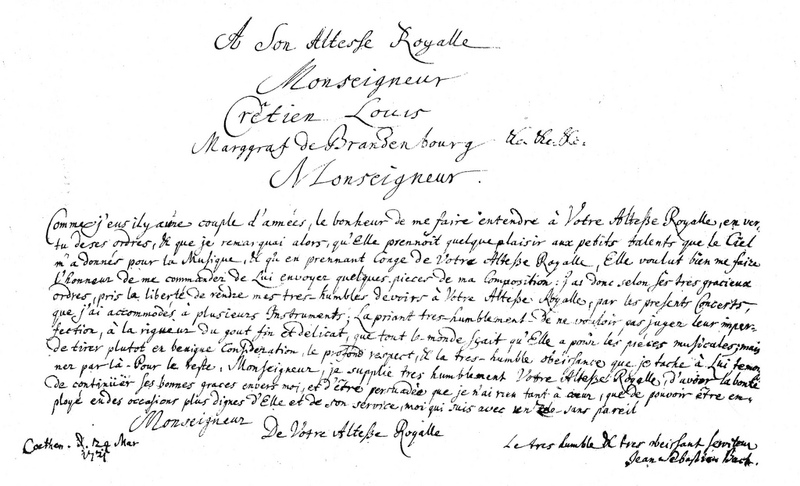 The full score was left unused in the Margrave’s library until his death in 1734, when it was sold for 24 groschen of silver (as of 2019, about US$ 30). 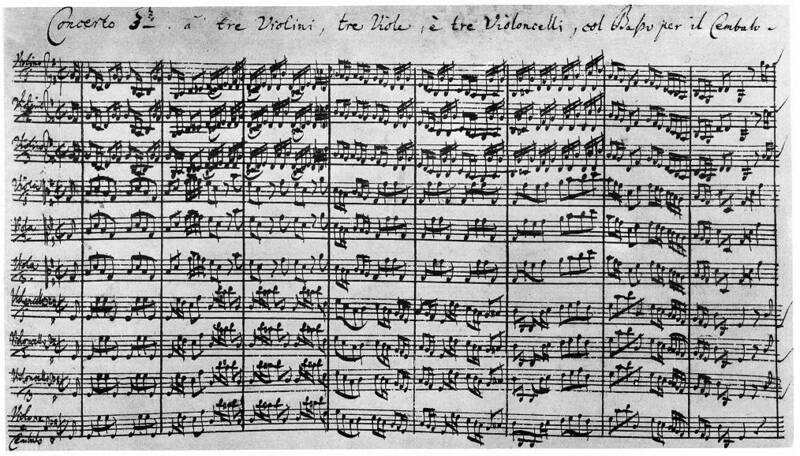 The autograph manuscript of the concertos was only rediscovered in the archives of Brandenburg by Siegfried Wilhelm Dehn in 1849; the concertos were first published in the following year. The manuscript was nearly lost in World War II, when being transported for safekeeping to Prussia by train in the care of a librarian. The train came under aerial bombardment, and the librarian escaped the train to the nearby forest, with the scores hidden under his coat.